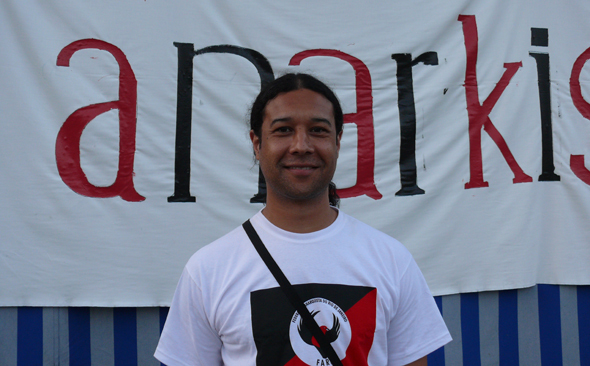 Warren: As a member of the anarkismo network, it was through that network that we firstly made aware of the fact that the conference was happening here, which for us was very exciting, and it was through that network that we received an invitation from one of the organizers. Motmakt: This is in St-Imier, Switzerland, where one hundred and forty years ago, the first anarchist international took place. And as such it’s a pretty historically loaded place to be, and this has also been called an attempt at a second anarchist international, do you have any hopes or expectations around that? W: That’s quite a long story because as syndicalism, or anarchist trade unionism develops at the end of the eighteen-hundreds and nineteen-hundreds, it also spreads through particular immigrant workers and anarchist activist to the north of Africa, particularly Egypt and then down to the south of Africa through Scottish migrant workers. In fact some of the first trade unions and political organizations that sought to mobilize and organize black workers, and by black I mean African coloured or mixed race, as well Indian workers in southern Africa, they were influenced by anarchism and syndicalism. However that disappears for quite some time.